I don’t know how many of you have gotten to see the new Disney movie release entitled Christopher Robin. I saw it with my kids a couple of weeks back in the theaters, and I have to say, as I sat there and gazed at the film, I was really taken aback by how profound it was in terms of portraying the difference between the classical notions of labor and leisure. If you are not familiar with the film, it is basically a sequel to the children’s classic Winnie the Pooh stories. Now Christopher Robin is all grown-up, and unfortunately, he has all but completely forgotten about his dear friends Winnie the Pooh and Tigger, Roo, Kanga, Piglet and the all the rest of the gang who live in the magical Hundred Acre Wood. It is very similar to Steven Spielberg’s Hook, which is the sequel to Peter Pan. In this case, Christopher Robin is all grown-up and has become part of the post-World War II corporate world. He works long hours, 14 hour days or so, and to the extent that he pays his wife and young daughter any attention, it is only to encourage them to focus on his daughters studies so that she can go off to boarding school like he did and get a good education in order to get a good job. And so, in the process of his neglect of his family and his complete obsession with his corporate job, Winnie the Pooh mysteriously shows up asking for help in finding Tigger and Rabbit and the rest of the gang who have disappeared from the wood. And so, Christopher reluctantly agrees to leave London and return to Hundred Acre Wood to help Pooh find his friends. Without giving too much away here, the moral of the story is that Christopher ends up discovering that he indeed is the one who is lost. He comes to realize that the life he’s been living is NOT, it is emphatically NOT what life is really and truly all about. Christopher Robin, reunited with all his childhood friends in that little wooded slice of paradise, is reminded once again of what it means to be truly human. What makes the story so profound, and what is so applicable for us today is that it underscores what in many ways is a life-changing ancient distinction between labor and leisure. This is a profound distinction that I try to grill in the hearts and minds of my students over the course of several semesters. In the ancient world, say in Greece in 500 BC, there was of course no such thing as Amazon.com, no Walmart or whatever shopping outlet you may have in your particular region. If you wanted vegetables to eat, you had to largely grow them yourself; of course, there were markets in the city, usually in the vicinity of the Temples, where the food was previously offered up to the gods. Nonetheless, if you were not going to be traveling sometimes considerable distance, you were gardening, or farming, or tending to livestock, or milking, or churning butter, or what have you. This is what is called labor, and labor involves doing something for the sake of something else. I like to ask my high school students if they work eight hours a day at Chick-fil-e because they like chicken so much? Of course, the answer is that they work those hours in order to get something else, namely money; I assure you, I have yet to meet a person who cleans out the deep fryer because they like fatty oil deposits. They are doing it because they want something else; they want money. However, the ancient Greeks recognized that this labor was fundamentally different than what they would call leisure. The actual Greek word for leisure was SCHOLE, the word from which we derive the term ‘school’. Now my students are always shocked to learn that. They ask what do you mean, school is leisure? School is a lot of hard work, isn’t it? Well, what we have to understand is that leisure classically speaking, as the ancients understood it, did not mean lying around on a hammock between two palm trees on a beach. That was not leisure. Leisure involved doing things for their own sake, doing those things which were their own justification. Labor involves doing things for the sake of something else, while leisure involves doing things for their own sake, for the sake of the thing being done. We engage in acts of leisure, reading a book, or gazing at art, or listening to or playing music or reciting poetry or reading a story to our children or simply gazing at a sunset precisely because these things are worth doing in and of themselves. The book, the art, the music, the poetry is the goal; there is no goal outside of the activity itself. This movie, Christopher Robin, profoundly captures this distinction. 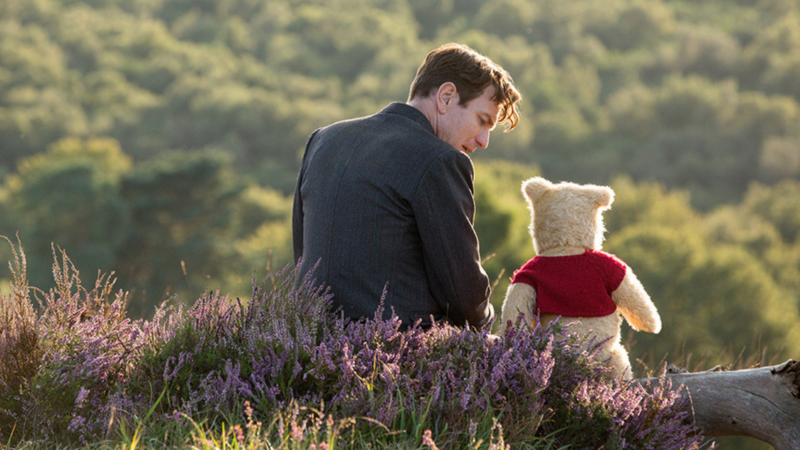 Throughout the movie, Christopher Robin who is completely distracted by the corporate world and its vision of the good life, keeps telling his daughter who is preparing for the examinations that will get her into the best boarding school in England, a boarding school she does not want to go to, she does not want to leave her mom and dad, her home. When he wants to try to inspire her, he keeps saying, ‘Nothing comes from nothing,’ which of course, metaphysically is quite true. But he meant it from the vantage point that if you want to get ahead in life, you are not going to get there without a tremendous amount of work that is being done for the sake of something else. The older Christopher Robin believed that THAT was all there was to it in life; all there was to it was working very, very hard so that you can provide for your family and become financially secure. That is what it is all about. However, Winnie the Pooh shares with Christopher something that Christopher had told him as a child years and years ago when they were all friends and used to play together in the Hundred Acre Wood; Pooh reminded him of this saying ‘Doing nothing often leads to the very best kind of something.’ Did you catch the reference to the importance of leisure for an enriched life, a life of human flourishing. I remember the British philosopher Roger Scruton explaining why it is that we are so often utterly enraptured when we encounter the beaming smile of a little baby. We stare in amazement and absolute joy whenever we encounter a little tiny baby smiling at us, cooing at us. He noticed that we often, and completely unconsciously, stop whatever we are doing and just gaze at this absolute beauty. You will notice that we do not begin thinking, Hmm, what can I do with this? What benefit is this going to bring to me? What is the cost/benefit analysis? We do not think in those terms when we encounter the beauty of a baby’s smiling face. We do not pick it up and try to eat it or perform experiments on it. We simply gaze in amazement and wonder and awe. In other words, from the Ebenezer Scrooge vantage point of profit and gain, we are in effect doing nothing. We are engaged in a moment of gazing that offers us no material gain in the least. And YET, it is precisely such moments that remain transfixed within our hearts and memories and most precious experiences for which there is simply no price. That is leisure; doing something for the sake of the thing itself, telling my children I love them for no other reason than the expression and beauty of love itself. Doing nothing often leads to the very best kind of something. That is the wisdom of Christopher Robin.